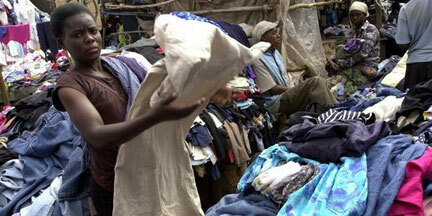 Second hand clothes dealers in Kenya could soon be rendered out of business if a drastic sessional paper sails through the Kenyan parliament. The controversial Sessional Paper Number 9 of 2012 seeks to ban the importation of used and second hand clothes in an effort t9o protect Kenyan textile and apparel industries most of which have closed down due to unhealthy competition. The move will also affect the importation of second hand shoes. If successful, the move, apart from driving thousands out of business will have a dilapidating impact of Kenya’s middle and low income cadre, most of who rely on the second hand clothes. If the sessional paper sails through parliament, the sessional paper, which has already been approved by the cabinet, is to be implemented as from January next year. Kenya’s Industrialization Minister Henry Kosgey whose ministry is spearheading the motion said the move is aimed at boosting the local manufacturing industry while at the same time creating jobs to thousands of Kenyan youth. “We cannot be talking of being a newly industrialized country in 2030 when we are importing even the most basic of clothing. We need to get jobs for our youth and this is the only way towards that,” he said. He said the ministry will work hand in hand with other government agencies to ensure that the banned products are restricted on the boarder and all points of entry. The move is a direct contradiction of the position of the Ministry of Finance. In his budget speech in June, Finance Minister Njeru Githae requested parliament to lower duty on imported second hand clothes in effects to increase access to clothing. The industrialization policy also seeks to ban the export of leather and place a two percent levy on imported leather products, clothes and shoes that will go to supporting local traders. Second hand clothes dealers and exporters of raw and unprocessed skins and hides are already up in arms and planning to challenge the move in court through their welfare union. The traders claim the government is keen on driving them out of business when it can revive the collapsed industries to compete equally with the imported clothes and footwear. The ministry of Industrialization has in the recent past made efforts to revive various sectors namely cotton, coffee, leather and pyrethrum over the last few years. In collaboration with the World Bank (WB) as the financier and managed by auditing firm Deloitte, the Industrialization Ministry organized a pilot funding program aimed at assisting the four sectors increase in revenue, output and create marketing links for the commodities. Between 2006 and 2011 the WB injected $6 million in the sectors through a Value Chain Based Matching Grant Fund Program. As a result, coffee production under the program went up by 48 percent, while under the ‘cotton to garment’ pilot projects, cotton production increased from under 100 kilograms to 3,000kg per acre. Sales revenue for coffee went up by over 50 percent and income per farmer rising by 348 percent from $105 in 2006 to $460 by 2011.